Gallbladder 20 (GB 20) spells H-E-A-D-A-C-H-E! This point is amazing for the treatment of headaches. The point is located at the top of the sternocleidomastoid muscle which runs from the back of the head down to the front of the shoulders at the clavicle. Treatment of this point will help relieve a headache, neck pain and shoulder tension. If you follow the gallbladder channel further down it’s pathway you’ll see that tension at this point is also related to low back pain, hip pain, and lateral leg pain. It’s really easy to apply pressure to Gallbladder 20 by grasping your own head and allowing your thumbs to fall into the point. Slight pressure can relieve headache pain and help to ward off pain and tension in other parts of the body as well. Try it. You’ll like it! 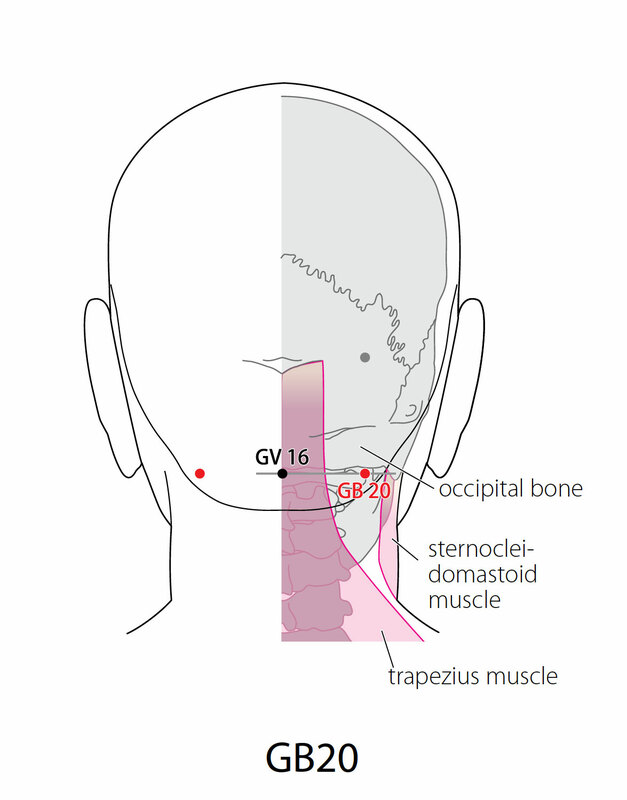 Location: In the depression created between the origins of the Sternocleidomastoid and Trapezius muscles, at the junction of the occipital and nuchal regions. Attributes: Meeting point of the Gall Bladder and Triple Energizer channels with the Yang Linking and Yang Heel vessels. TCM Actions: Courses wind and clears heat; clears the head and opens the portals; brightens the eyes and sharpens the hearing; frees the channels and quickens the connecting vessels; harmonizes Qi and blood. Indications: Headache; visual dizziness; pain and stiffness of the neck; painful reddening of the eyes; deep-source nasal congestion; pain in the shoulder and back; heat diseases; common cold; epilepsy. Secondary Indications: Clear, runny mucus and nosebleed; tinnitus; deafness; wind-stroke loss of speech; lumbar and back pain; unilateral and bilateral headache; insomnia; goiter; madness; absence of sweating in cold damage or thermic disease. Needle Information: Oblique insertion .5 – .8 cun towards the tip of the nose with the tip of the needle slightly downwards, or subcutaneous insertion through DU 16. Moxibustion is applicable. Cautions: Deep needling may damage the spinal cord. 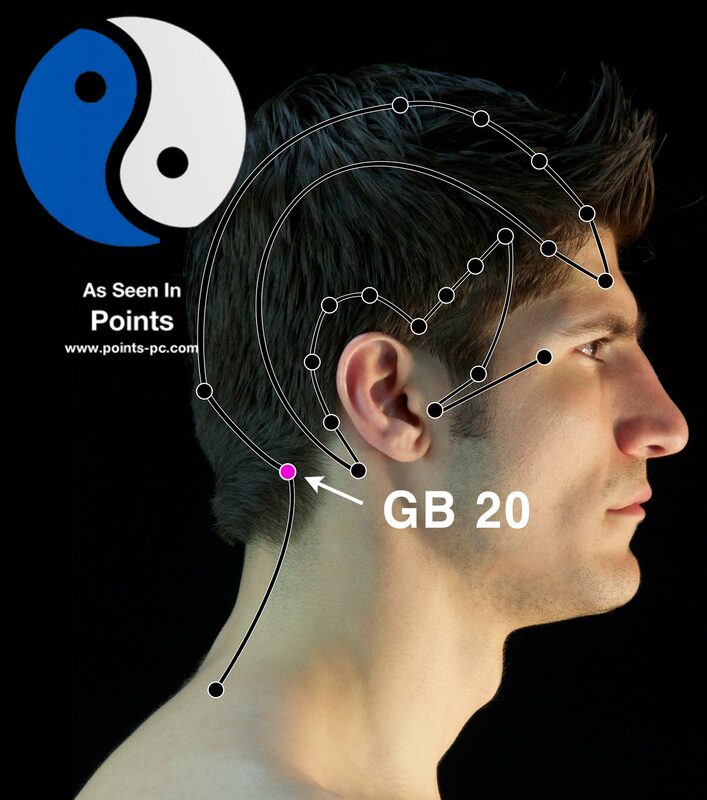 Yes, many acupuncture points have a variety of effects that don’t get listed. I’m glad to hear it’s helping. Any studies with people who suffer from cluster Headaches? My acupuncturist recommended this for me. Unfortunately, cluster headaches are a whole different world from other types of headaches. This point may help, and is worth trying though. It is interesing that it helps to relax and for digesting allergenic foods etc. 1. Would like to hear from You how long (seconds) to apply pressure to secret spot GB 20 and how many times to apply pressure to this GB 20? 2. I do this GB 20 30minutes after dinner or meal when I feel I need to. Is it okay or maybe You recommend to wait longer? Pressure of 15-30 seconds is adequate, and your 30 minute timeframe is OK.
1. I understood now but how many sets is recommmended daily ? = ) 2 or 3 times? Adam, it’s really your choice to see what is effective. You can use up to three times per day with no problem.